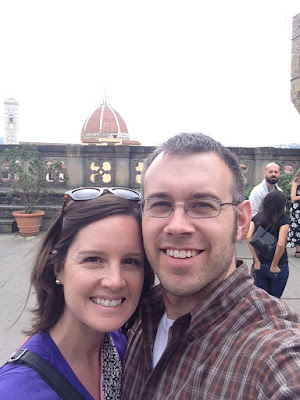 It was definitely worth spending the money on the Firenze card, as it allowed us to bypass all the long lines everywhere--including at one of Florence's most famous attractions, the Uffizi Gallery. Housed in the 16th-century offices (uffizi is Italian for "offices") of the ruling Medici clan, the museum is home to centuries of celebrated art, including pieces by Michelangelo, da Vinci, Rembrandt, Botticelli, Titian, and Raphael. A plaque at one point explained that "one of the Uffizi Gallery's most distinctive peculiarities--an approach cultivated from the outset--concerns the very concept of art history, which is seen here not as a sequence of different periods but rather as a seamless path stretching from the ancient world to the present day." The gallery is structured so that you generally follow a chronological path, beginning with 13th-century altarpieces and continuing on into 17th- and 18th-century paintings. Another wing leads you through Greek statues and portraits from the Classical era and then on to Tuscan 15th-century artists who were trained to emulate that ancient art. Not being well-versed in art history, not to mention the fact that the museum's size makes it impossible to take in everything, it was very helpful to have Lonely Planet's Pocket Florence and Tuscany to point out some highlights. Even with this guide, it was still overwhelming. I was also glad I'd read Sarah Dunant's historical novel The Birth of Venus--although fiction, it provided me with a greater understanding of and interest in Renaissance paintings in Florence. The sheer volume of art depicting Mary was mind-boggling. I can appreciate that in the Medieval period, the only accepted subjects for art were religious...but for crying out loud, how many more thousands of Bible characters and stories are there to choose from?! In between admiring art, we admired the view along the corridors of Ponte Vecchio ("the old bridge") on the Arno River. One thing that particularly amazed me was how the colors on these paintings have lasted so long. Ghirlandaio's 15th-century Adoration of the Magi and Michelangelo's early 16th-century depiction of the Holy Family featured such vibrant, vivid hues, it was hard to comprehend how they could actually be five hundred years old. While overwhelming, the Uffizi was certainly a striking introduction to Florence. Next up: Santa Croce. Your comment "by "recent" I mean "less than 500 years old"--that, in a nutshell, is Italy for you)" made me chuckle. Reminded me of a talk I had with someone when I worked at the museum. How they joked that Americans think things are "old" but the person I was talking to was someone who'd worked in Ireland on an excavation of a building that was thousands of years older than any building in the U.S. Just brought to mind our perceptions of history and how much older architecture most of Europe has all around them every day! Pretty neat! Yes, Danielle--Steve and I kept marveling and laughing at that the entire time we were there. It is hilarious to think that our house, for example, is considered OLD...it was built in 1938. To Americans it seems an antique...the Italians would call that new construction! I found it mind-boggling to ponder how incredibly old so much of Italy is.